Many Eph sports teams returned to campus last week after taking spring break training trips to warmer climates. While away, the student-athletes competed against opponents from across the country and honed their skills for the upcoming spring season while still exploring their surroundings, enjoying some sun and spending quality time with their teammates. The men’s and women’s crew teams made an over 15-hour bus journey to Myrtle Beach, S.C., where they rowed in the water for the first time since the fall. While there, the men and women were hosted by the Briarcliffe RV Park, a mobile home community that has welcomed the Ephs for many years. The residents made breakfast for the teams each morning and invited them to use all of the community’s facilities. The teams then reconvened for their afternoon practices and shared nightly team dinners. After dark, the women decompressed with board games. Bananagrams and Settlers of Catan were two team favorites, Rush said. 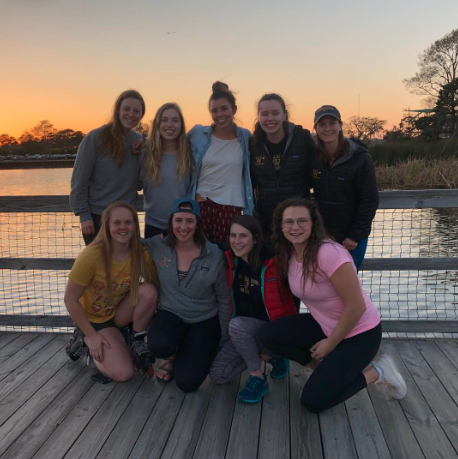 Toward the end of the trip, the team hosted a skit night, which Rush described as “always pretty funny and pretty awkward.” The night began with a team sing-along with Briarcliffe residents. “We get in touch with our country roots and sing a lot of Johnny Cash,” Rush said. This trip concluded with “Race Day,” an opportunity for the men’s and women’s teams to compete against each other. Despite an early morning start, the crews enjoyed watching the sunrise on the water before heading back to Williamstown. The track and field team also headed to a warmer climate, flying to San Diego to train and compete for two weeks. On days when they were not at competitions, the team practiced in the mornings and then spent the remainder of the day exploring Southern California. Men’s tennis also travelled to the West Coast, competing in San Diego and Claremont, Calif. Over the course of the trip, the men played eight matches. On game days, the team woke up early, competed until the afternoon and then gathered for dinner and some bonding time.